Functional circuit board testing presents many challenges that are often costly and time consuming. Most functional tests need to be customized for each design, limiting reusability. This results in software engineers vying for time between development code and test code. Even when functional tests become available, the diagnostic details are often inadequate to give clear visibility on a given problem. ScanExpress JET is a tool designed to overcome these challenges by automating the functional test generation process on CPU–based IEEE-1149.1 compliant circuit boards. 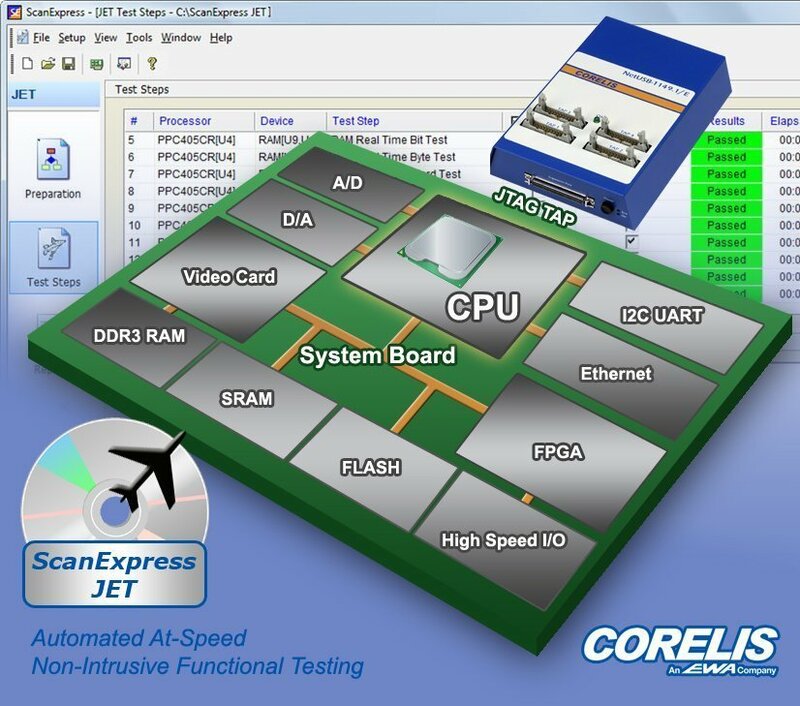 Coined JTAG Embedded Test, JET is the preferred method for at-speed, non-intrusive functional testing. The host software automatically uses these features to download test & diagnostic routines into the CPU’s cache or external memory. These routines then execute at full processor speed and send results back to the host. Corelis also supports the following processors. Click Here. For more information, please contact Corelis sales. JET requires a UUT with a JTAG-enabled processor having external access to its Test Access Port (TAP). A Corelis controller serves as the interface between the PC and the TAP interface. Boards typically include a single JTAG TAP connector that is dedicated to the CPU. This TAP is often used for JTAG–based software debug and emulation. Boards may also include other JTAG TAP connectors, primarily being used for boundary-scan test and in-system programming. The figure above depicts connecting a Corelis NetUSB-1149.1/E™ four-port JTAG controller to a board that includes three separate TAP connectors: a CPU with a dedicated JTAG port, and two additional JTAG ports containing other boundary-scan compatible devices. The ScanExpress JET system is also able to handle cases where the CPU and other boundary-scan devices share the same scan-chain. Preparation – Several screens that guide the user step by step on how to collect information about the devices and setup of various test options. Following these steps, the tool automatically produces the functional test steps. Test Steps – Program that executes the test steps that were previously created by the preparation function. Reports – Analysis program to view and calculate test coverage statistics. Execution with the ScanExpress Runner option – Invokes the ScanExpress Runner test executive to run both boundary-scan and JET tests from a single test plan. Devices – The tool requires knowledge of CPU visible resources in the circuit. This includes information such as memory device features including size, width of the addresses, etc. Much of this information can be obtained automatically by the tool. Custom test scripts – User developed test routines beyond those automatically created by the tool. Completion of the Preparation phase results in the automatic creation of scripts, download routines, and embedded testing steps required to perform specific board testing. JET is able to increase board test coverage by quickly combining boundary-scan testing with at-speed functional testing. JET is able to save coding time through automatic test and diagnostic generation. JET can be used to field validate a customer board or upgrade firmware on-site. JET can identify board failures quickly reducing the repair cost per unit. 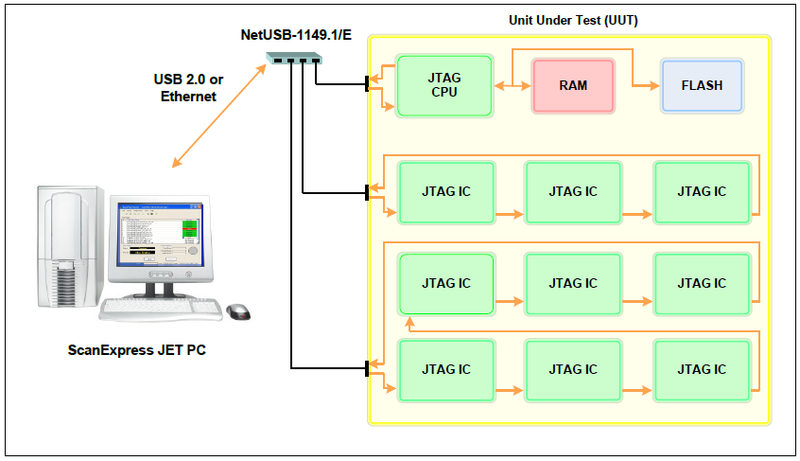 The JTAG Embedded Testing (JET) method extends coverage beyond popular boundary-scan techniques to virtually every signal of the UUT that is accessible by on-board CPU(s). This includes most of the remaining non-scannable, analog and I/O port resources. ScanExpress JET Test Development System supporting both Test Program Generation and Execution. CPU specific support package for ScanExpress JET. Contact Corelis for a list of supported processors and part numbers. Note: At least one CPU support package must be purchased with the ScanExpress JET Test Development System.